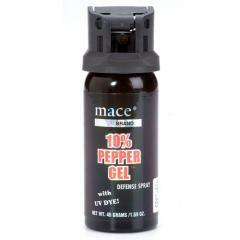 Home > Mace > Pepper Spray > Personal Pepper Spray > 80269 Large PepperGel Spray 1.59 oz. 80269 Large PepperGel Spray 1.59 oz. This Large PepperGel Spray from Mace contains a special gel formula that sticks on contact, preventing the target from wiping it away. It contains 1.4 percent capsaicinoids, making it one of the hottest sprays on the market. It creates no mist, minimizing the risk of cross-contamination and making it suitable for indoor use, and is also less affected by wind than a traditional liquid spray. It also contains an ultraviolet dye, helping police to identify the assailant. It contains enough formula for 10 to 20 bursts, with a range of up to 18 feet. The flip top safety cap prevents accidental discharge while not in use. ©2002-2019 CopsPlus.com: Mace 80269 Large PepperGel Spray 1.59 oz.